The Sheffield Fans Derby is an annual 11-a-side football event where supporters of Sheffield United FC & Sheffield Wednesday FC come together to raise money for different appeals of Sheffield Hospitals Charity. To date over forty thousand has been raised. The next event will take place on Tuesday 7th May 2019 at the New York Stadium (home to Rotherham United FC). The event registration process for players wanting to participate in the event has now opened. The Sheffield Fans Derby (SFD) makes its long awaited return in May 2019 following a year off to recharge the batteries. 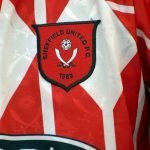 The unique annual charity football match held between fans of Sheffield United and Sheffield Wednesday has raised £43,043 in ten years encompassing fourteen different Charity appeals. The last event took place in May 2017 at Bramall Lane and went all the way with the Wednesday Fans winning in a tense penalty shootout in front of the Kop. Following in the footsteps of the last event we are delighted to be taking #SFD15 to the home of another local Championship side, Rotterdam United, with the New York Stadium hosting the event in May 2019 as a neutral venue. Sheffield United Fans v Sheffield Wednesday Fans. Tuesday 7th May 2019, 7pm KO. Supporting Sheffield Hospitals Charity Dementia Appeal. If you want to play in this event the registration process is open and closes at midnight on 30th November 2018. To participate in the event each selected player must pay a registration fee of £40 to confirm their place in the squad. Each player will then have to raise a minimum of £60 sponsorship, although we ask every participant to raise above and beyond this amount. Don’t delay in registering to represent your team in #SFD15 as places for this unique event are always in high demand. Sheffield Fans Derby is a full 11 a side game played, sanctioned and officiated under FA rules, managed completely by volunteers. A different charity is chosen for each game and funds are raised by the players receiving sponsorship for taking part, corporate sponsorship of the program, match ball etc and ticket and program sales on the day of the event. From very humble beginnings raising a few hundred pounds for Sport Relief 2008 it has developed into an organised event using professional football grounds.